Joyce’s early recordings are without exception far too poppy for me despite her obvious vocal talent. But her final Okeh release is a different matter altogether. Even a cursory look around the internet will show you that all the attention is lavished on the “Hello Heartaches” side and although it is a pleasant Windy City midpaced item it is nothing special. In my view it is clear that the nugget of gold is hidden on the other side – as is so often the case. 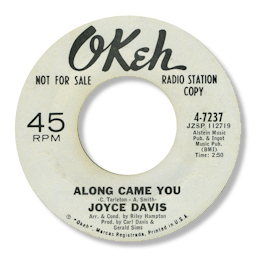 Along Came You deserves the plaudits, not just for the excellent bluesy guitarist and the well arranged horns, but for Joyce’s really well modulated vocals, lovely delay singing especially when she stretches out the words. The chord changes to the song sound just right as well. UPDATE ~ Bob Abrahamian writes with the very interesting info that the great James Phelps was Joyce's brother. I'm grateful to him for this. Note ~ "Hello lover" can be found on the Kent UK CD "Okeh A Northern Obsession Vol 2".